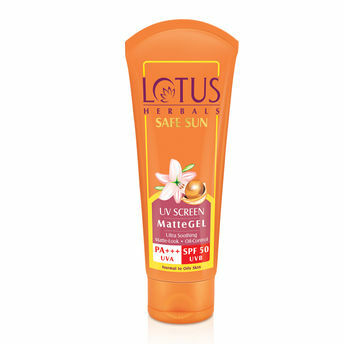 Lotus Herbals Safe Sun UV Screen Matte Gel Pa+++ Spf - 50 is an innovative sunblock which is totally non-oily and provides a freshness to your skin. Enriched with the goodness of Horse Chestnut, Comfrey and Vanilla extracts, it protects your skin against varied forms of sun-induced damage like skin tan, sun burn, premature ageing and skin cancer leaving your skin with a smooth and matte feel. Explore the entire range of Face Sunscreen available on Nykaa. Shop more Lotus Herbals products here.You can browse through the complete world of Lotus Herbals Face Sunscreen .Alternatively, you can also find many more products from the Lotus Herbals Safe Sun Uv Screen Matte Gel Pa+++ SPF - 50 range.